Haywards Heath Dementia Action Alliance (HHDAA) was set up in January 2016 by local residents and professionals. The HHDAA's aim is to help people with dementia feel part of the wider community, raise awareness of dementia and improve the quality of life for those living with dementia and their carers. These are some of the small steps in bulding a 'dementia friendly' community. HHDAA members most of whom are Dementia Friends Champtions, can offer Dementia Friends sessions, which last an hour, are free and give the attendee a better understanding of dementia. At Dementia Friends sessions, you will:. 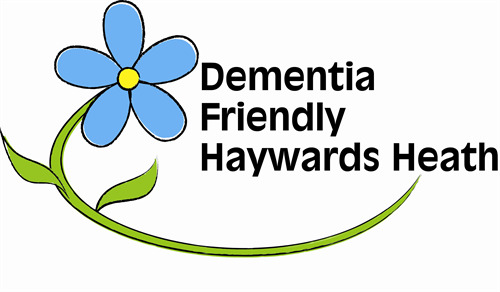 If you would like more information on how to join the HHDAA and help build a Dementia Friendly Haywards Heath, click here. To read the HHDAA flyer, please click here. Know Dementia's Memory Moments Cafe, in partnership with St Richard's Church takes place at St Richard's Church Hall, Sydney Road, Haywards Heath, RH16 1QE, on Tuesdays from 2.30pm to 4.30pm and Saturdays from 2:00 to 4:00pm. The dates of the cafes for the remainder of 2019 are published on the website of St Richard's Church. To view this information, please click here. Everyone is welcome to the cafes, especially those with memory problems and their family supporter/carer. The cost is £1 for limitless tea/coffee and biscuits. There are also games, singing, dancing and fun. For more information on local support and services offered by Know Dementia, please click here. Apart from the Haywards Heath Dementia Action Alliance (HHDAA) and Know Dementia's Memory Moment Cafe in Haywards Heath, we are happy to provide below links to other sources of information and support across Mid Sussex. Dementia Friendly Mid Sussex. For more information on Mid Sussex District Council's plans to become Dementia Friendly, please click here. Dementia Support in East Grinstead For information on the East Grinstead Dementia Action Alliance, please click here. Supporting Those with Memory Loss Please click here to download a leafletentitled 'A Guide to Supporting those with Memory Loss'. Alzheimer’s Society Services Please click here to to access contact details for Alzheimer's support in the local area. Sussex Police are encouraging familites who may have a relative living with Dementia to complete and return a Missing Person Lifestyle Information form. This form will assist the families and ensure that the missing person is quickly located by the Police in the event of them going missing. Click here to find out more information of Helping Pepople living with Dementia in our Community from Sussex Police. Click here to download the Missing Person Lifestyle Information form. A site designed to provide patients with dementia, their carers and family members with helpful resources and information. Please click here to visit this website. The Alzheimer’s Society’s Dementia Friends programme is the biggest ever initiative to change people’s perceptions of dementia. It aims to transform the way the nation thinks, acts and talks about the condition. To visit their website, please click here. Dementia UK provides specialist dementia support for families through their Admiral Nurse service. To visit their website, please click here. Dementia Adventure is dedicated to supporting people to live well with dementia and have a sense of adventure in their lives. To find out more, visit their website by clicking here. The UCL Dementia Research Centre is a hub for clinical research into various forms of dementia. They focus on identifying and understanding the disease processes that cause dementia, the factors that influence these and how best to suport people with dementia and their familities. They provide links to lots of information and resources to help people and their families dealing with dementia. To visit their website, please click here. Arts 4 Dementia believes that people with dementia and their carers have the right to enjoy life to the full. Participating in arts activity, rekindling and learning new artistic skills enables them to bypass dementia symptoms and enjoy new creative experiences together. To find out more about Arts 4 Dementia, please click here.